Fielding Lucas, Jr. (1781—1854) was an outstanding early 19th century American cartographer and map publisher, artist, musician, stationer, and civic leader. He was born in Fredericksburg, Virginia, moved to Philadelphia for work and/or education as a teenager, and spent his professional career in Baltimore. Two of his published maps pertain to Tennessee, aka “western North Carolina” (yes, I’m justifying their inclusion in the North Carolina Map Blog). Neither of these maps is recorded by Philips in A List of Maps of America in the Library of Congress..., or by Wells in A Checklist of Tennessee Maps, 1820-1830. The maps are also not described by Ristow in American Maps and Mapmakers. These two maps have been long lost and forgotten… until now. In 1818, John Melish published a Map of Tennessee Constructed from the Surveys of the late John Strothers [sic] and other Documents By John Melish. 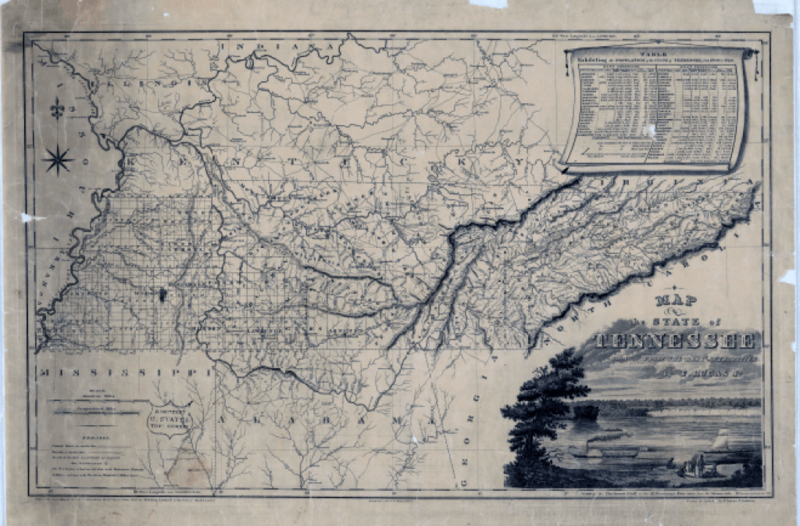 This 15×24″ map, published before the Chickasaw nation’s final cession of Tennessee land, shows all of Tennessee between the Mississippi River and Tennessee River as belonging to “Chickasaw Indians”. The cession of this land occurred in late 1818 (treaty proclamation date in January 1819), leading to the formation of the 9th – 13th Surveyors’ Districts. The Tennessee State Library & Archives has surviving manuscript maps for each of these districts except the twelfth.1 The information from the individual district manuscript maps was compiled into a single 24×20″ map by Fielding Lucas and published on or about November 1, 1822, as indicated in the following advertisement. Advertisement for Fielding Lucas’s Map of the Western District of Tennessee, published on or about November 1, 1822. From the December 3, 1822 issue of the Western Carolinian (Salisbury, NC). Image courtesy of the State Archives of North Carolina and available on line via the North Carolina Newspaper Digitization Project. Thus far, only a single possible surviving copy of this map has been located. The British Library catalog describes a map by that title but, based on their catalog description, the map apparently contains no date, size, or other identifying features. This map is currently missing and no digital image of it exists. Eight months after publication of his map of the Western District, Lucas published a map of the entire state. Measuring 25×36″, it was the largest map of Tennessee until Matthew Rhea’s monumental map in 1832. Map of the State of Tennessee, Drawn from the Best Authorities by F. Lucas, Jr. carries a copyright imprint dated the 21st day of June, 1823. Image courtesy of National Archives, College Park, MD. This superb map includes an engraved view of the Chickasaw Bluff that was based on a drawing or painting by Lewis Brantz. A table with detailed population statistics adorns the upper right corner. The western part of the state has district names and county names and boundaries superimposed on a grid of squares that were the result of the recent district surveys. Lucas advertised the map as published and for sale in the 19 August 1823 issue of the Baltimore Patriot. Since the digitized newspaper is copyright protected, you’ll have to settle for the following transcription. in a portable form, four dollars. 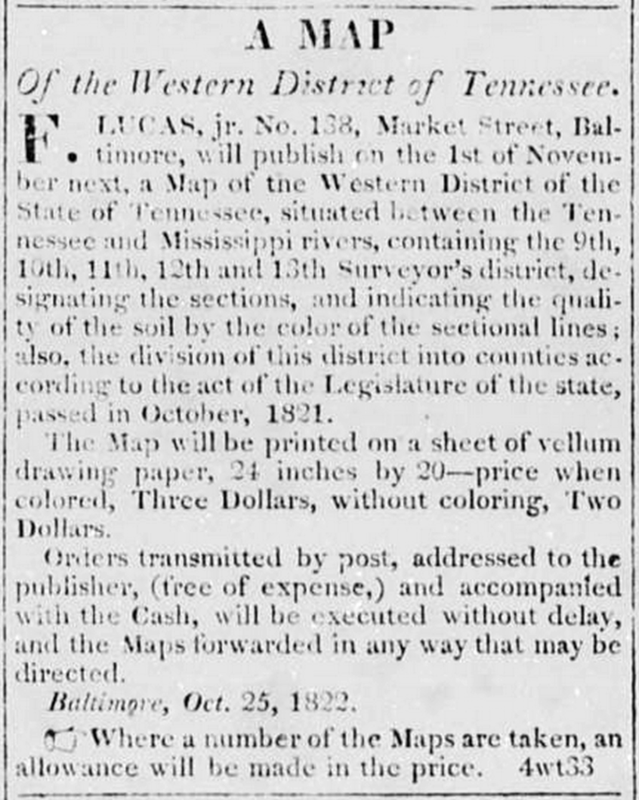 Lucas advertised the Map of the State of Tennessee… for sale as late as 1830. However, an internet search has, thus far, located only 3 surviving copies of this remarkable map. The copies in the National Archives (College Park, MD) and the British Library are uncolored. The copy in the British Library is trimmed to the neat line, sacrificing the publisher’s dated imprint. Whether the copy in Herzogin Anna Amalia Bibliothek in Weimar, Germany, is colored or uncolored is not yet known for certain, but the catalog description makes no mention of coloring. An approximately 13 Mb pdf of the map from a scan of the copy in the National Archives is available and can be requested using the “What’s on your mind?” comment box below, assuming the recipient’s email server allows files of that size. If anyone knows of other copies of either of these Fielding Lucas, Jr. maps, or if there are any Tennessee map authorities with corrections or additional information, please let us know via the “What’s on your mind?” comment box below. This entry was posted in 19th Century, Cartobibliography, Geological Maps, Map Advertisements and tagged Fielding Lucas, Fielding Lucas Jr, Tennessee maps by crmaps. Bookmark the permalink. I’ve got one of these maps of TN, I believe. F. Lucas >>1823xx (handwritten date). B.T. Welch & Co.Sc. Thing that caught my eye initially (aside from the date) was: left side– “89° West Longitude from London”. Implying that the location of London was significant still. It was passed down to me from my grandfather who worked for TVA. Was always under the impression that it was a TVA nap until I recently paid attention to some of the markings. Please email me if you have any more information. Update: JG’s map is the 1823 atlas map of TN by Fielding Lucas.